“Rise Up! 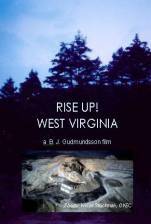 West Virginia” A Campaign to Turn the Tide! We know what the surveys tell us! 80% of the people in West Virginia are against Mountaintop Removal. When others around the United States hear about MTR they are instantly opposed to it. In fact, it may be in their backyard without them knowing it. We also know that most people have NEVER been to a Mountaintop Removal Site. If they could see it we could put a stop to it. We want to take them there! You can help us do that! DONATE A DVD and Help Us Empower the People! > You designate the receiving library, school, group or politician. > We will print your donor information on a label inside the cover. > We will enclose a letter to the recipient telling them about your gift and include your personal message if requested. > And we will drive it the post office and send it on its way. 4. Type in your special instructions for the donor label and/or your personal note to the recipient. 5. Continue to Next Page will direct you to PayPal for making your payment. You may choose how many DVD’s are sent to the recipient. The shipping amount will remain the same. Your gift will be sent out post- haste! It doesn’t get easier than that! I have been on Kayford Mountain and watched people as they step out onto that ledge for the first time. They always cry – sometimes uncontrollably. They cannot believe what is happening to the mountains and the people of West Virginia. They can’t believe that they live in a country that is allowing this to happen. They go home, take a hard look at their own energy use and they turn off the lights! They make calls to their representatives. And they tell their friends and their churches about what is going on here. They instantly RISE UP! Going to Kayford Mountain changed my life. It is why I stopped everything and joined this huge effort to Stop Mountaintop Removal. And the truth is – I still cry every time I go there. “Rise Up! West Virginia” lets them ride in the car with me as I travel our roads, meet our people and hear their stories. Hopefully they will come to the same conclusion that I have: West Virginia is being blown off the planet and we have the power to stop it! View Photos from the film!